Immigration is a hot-button issue. Donald Trump is cheered in some circles for his criticism of Mexican immigrants. In Europe, political parties are getting more and more traction as they campaign against unbridled immigration. I’m not going to write about the pros and cons of various immigration policies. 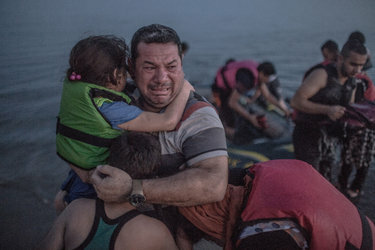 A Syrian refugee…breaks out in tears of joy, holding his son and daughter, after they arrived safely in [Greece]. I’m writing this because I find it easy to read the news and be very detached. But, it’s another thing to find that there are real human beings behind every public policy debate. Incredible picture. Thanks for sharing. Tragic beginning to the 21st century.